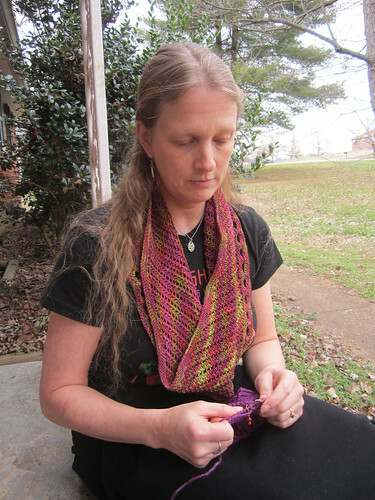 We had a warmer and sunnier day for the first time all week so we headed outside for a photo shoot of the new designs we have knit in my yarns. If you remember in my last post that I mentioned we have some new designs by my daughter Heather Alwood and you will find her patterns in our booth this coming year as well as in her own Ravelry Store which is the official place to go if you prefer a download copy. 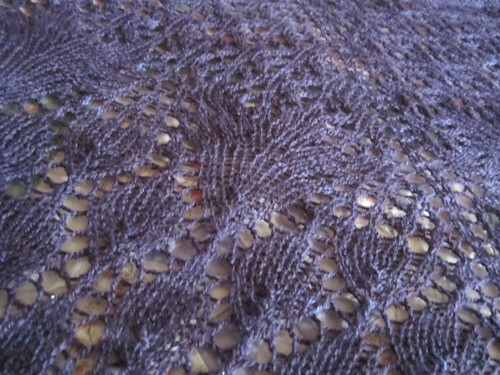 I showed you a sneak peak of the Spiral Effect Cowl, which was still un-named at the time. 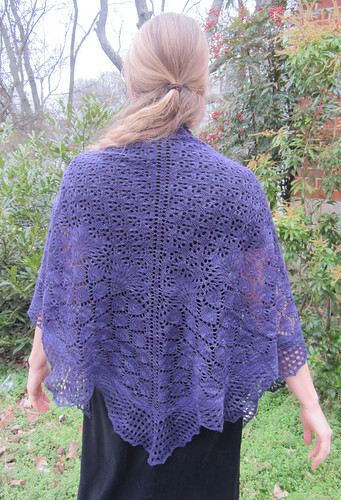 She will have a download link for you as soon as I finish my test knit of the pattern and it is ready to be published. I have a few better pictures to show you now though. 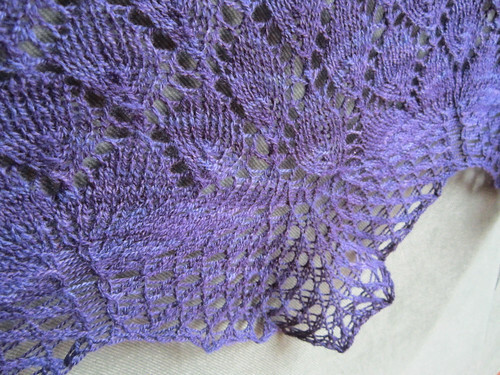 Like the Spiral Effect Cowl, the Summer Showers Shawl is made from one skein of Classic Merino Superwash Sock yarn. She used the Winter Sky for this one. I like wearing it this way, like a scarf. 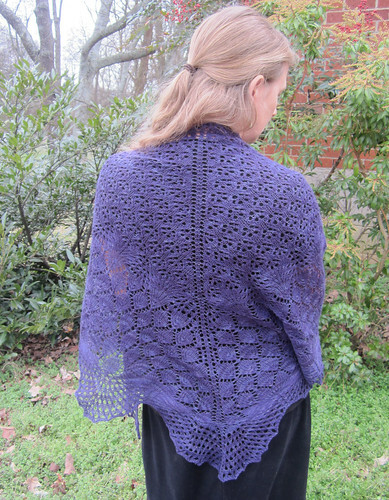 But it’s sized nicely as a shawlette too. 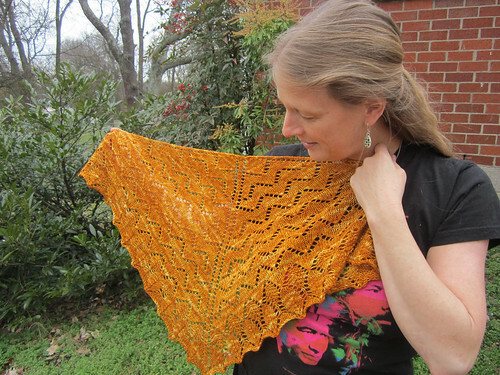 The Wings in Flight Shawl is also knit from the Superwash Sock but in the warm, French Marigold color. 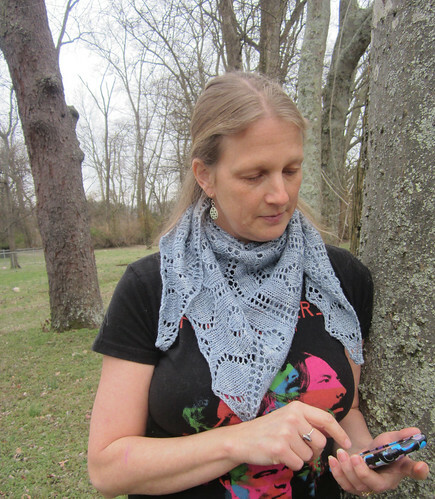 Again, this is my favorite way to wear this little shawlette. It’s perfect with a sweater for an accent, or to keep off the draft on a chilly day. 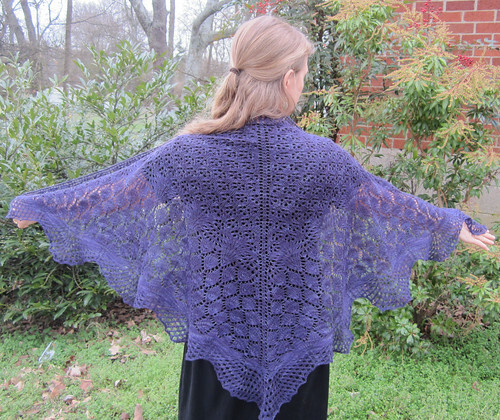 The Ode to the Butterfly Shawl has a whole different feel to it. It is light weight and delicate, with exquisite detail. 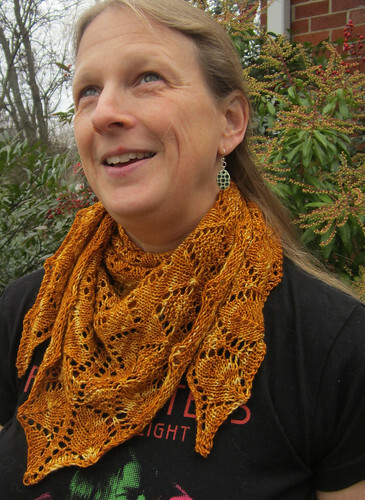 I love it so much in the Classic Merino Lace, which has the most wonderful softness and stitch definition. Well you will see for yourself in the close ups I took. 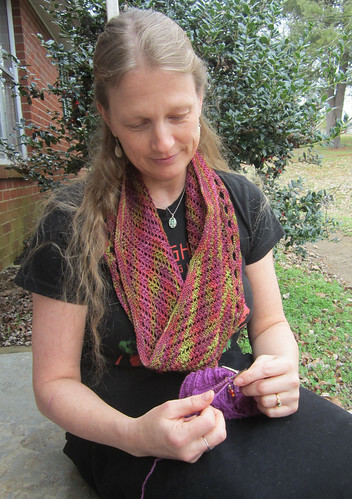 She used 3 skeins of Damson Plum, which is a deeper, more saturated color than the photos show. It is notoriously hard to get this color to display accurately in digital imaging. The shade is right, but deeper. 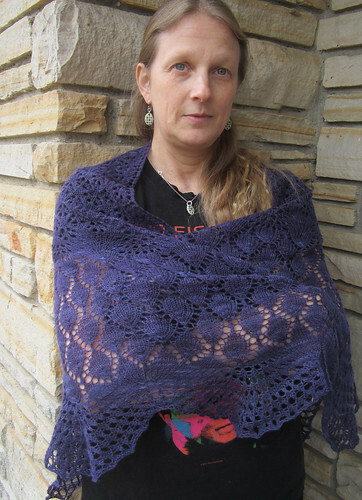 Another thing I love about this shawl is the way it hangs when worn. It perches just right about the shoulders without constantly feeling like it is sliding off. 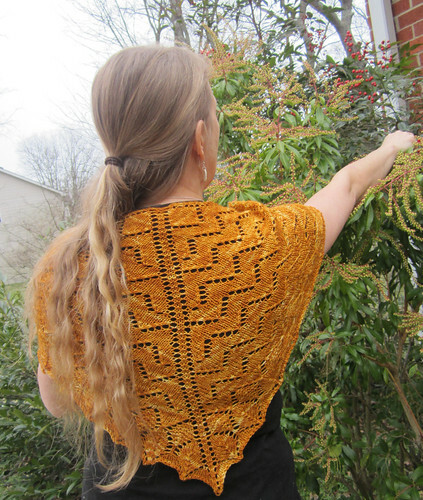 It’s similar to the way a Faroese shawl fits, but it’s a triangle. It is warm and cuddly despite it’s delicate look. See what I mean about the stitch definition? The knitting is perfection too. I think she may be better than me, LOL! I am especially taken with the edging. 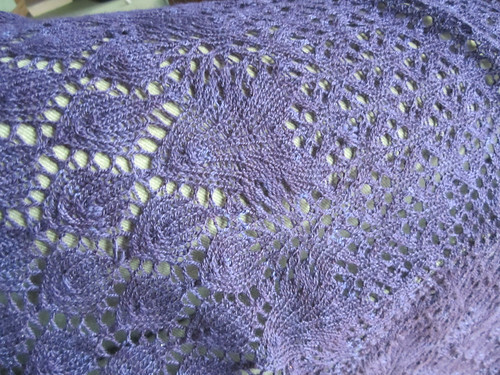 Okay this post is rather long so I will save my knitting updates for my next one. 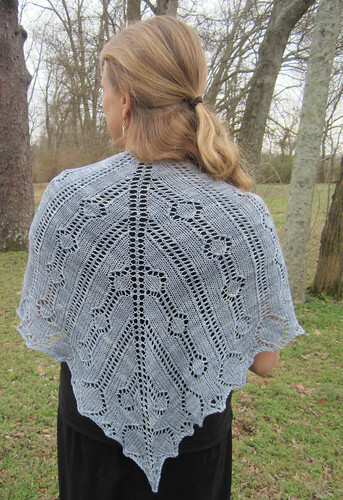 Go buy some patterns and cast on a shawl! Those are all so pretty, but I especially love the Ode to Butterfly–and its edging! Oh, I need to get back to lace.